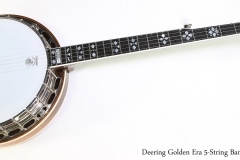 The Deering Golden Era 5-String Banjo draws from the heritage of traditional bluegrass banjos, and delivers the tone and look of the classic instruments. Built during 2004 at the Deering shop in Spring Valley, California, this Golden Era is in good condition and has been cleaned and set up at The Twelfth Fret by Anne Hartman. We’ve replaced the head and installed a Presto tailpiece. The dark stain shaded finish really sets off the flame Maple used for the resonator and neck. 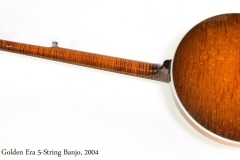 “A maple, prewar style bluegrass banjo made like the classic banjos of the 1930’s with the same materials and the same weight, design and features, the Golden Era is one of our most popular banjos for traditional bluegrass bands. If you’re looking for that classic bluegrass banjo tone and look – this is the banjo for you. Adorned with a traditional hearts & flowers inlay pattern, this banjo has the appearance and feel of the prized banjos from the 1930’s. Check out the video, which features JigJam performing Irish tune “The Mermaid”, with a Deering Golden Era in play.